The spiral dance or turning or whirling dedicated to Divine Remembrance, can be traced back in many religious tradition including in ancient Jewish mystical traditions. What is fascinating to know is that Jesus Christ himself did perform such whirling dance with his twelve disciples as recorded in gnostic text. It does also affirm what many scholars have suggested that Christ born and raised in Jewish faith and tradition surely was exposed to its inner mystical traditions. i am currently reading a fascinatingly beautiful book, The Mystic Spiral - Journey of the Soul by Jill Purce which turning out to be one of the best books on spiritual symbology i ever came across. The subject matter as the name suggest is the mystical spiral and its over whelming presence in different spiritual and religious tradition. hopefully i will come back again and again quoting from this book for its rich depth of wisdom. 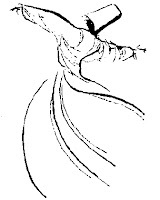 as i was posting on whirling dervishes, it was a wonderful synchronosity really to come across the mentioning of Jesus Christ doing the whirling, turning dance just at this moment! Glory be to thee, Father. And we, going about in a ring (encircling), answered him: Amen. Glory be to thee, Word: Glory be to thee, Grace. Amen. Glory be to thy glory. Amen. wherein darkness dwelleth not. Amen. Now whereas we give thanks, I say: I would be saved, and I would save. Amen. Grace danceth. I would pipe; dance ye all. Amen. I would mourn: lament ye all. Amen. The number Twelve danceth on high. Amen. The Whole on high hath part in our dancing. Amen. Whoso danceth not, knoweth not what cometh to pass. Amen. I would flee, and I would stay. Amen. I would adorn, and I would be adorned. Amen. I would be united, and I would unite. Amen. A house I have not, and I have houses. Amen. A place I have not, and I have places. Amen. A temple I have not, and I have temples. Amen. A lamp am I to thee that beholdest me. Amen. A mirror am I to thee that perceivest me. Amen. A door am I to thee that knockest at me. Amen. Thus, my beloved, having danced with us the Lord went forth. And we as men gone astray or dazed with sleep fled this way and that. [> ] you may read the full text from here. About the Acts of John | it is an early 2nd-century Christian collection of Johannine narratives and traditions, long known in fragmentary form. The traditional author was said to be one Leucius Charinus, a companion and disciple of John. The Acts of John is considered one of the most significant of the apocryphal apostolic Acts. It preserves strains of early oral traditions about the "beloved disciple" and sole apostolic author of a canonical gospel text. The Gnostic text also contain two extraordinary mystical sections which are in character distinct from the rest of the document. The first recounts the sacred words and actions of the Lord on the night before his death. This is followed directly by the second, recounting the vision John received of the Lord at the moment of the crucifixion.
. Hymn of Jesus - an excellent document with commentary.